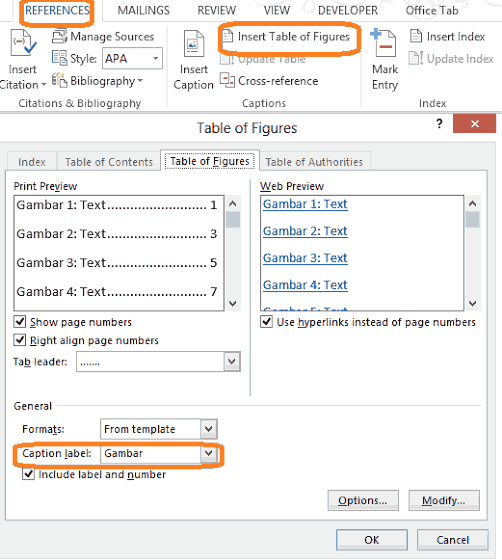 Under Reference menu, click Insert Table of Figures Clear the box next to 'Use hyperlinks instead of page numbers' Make sure you select Table for Caption label box... My question is tho, how can one also 'assign' referenced figures '(Fig.4)' in the text to do the same thing - aka change when an image is added above it? EDIT: Figured it out.. In word go to Insert and Cross-ref and assign the ref. On the References tab, in the Captions group click Insert Table of Figures. In the Table of Figures dialog box, click OK. If you want to change the appearance of the figure table, see Change the table of figures' appearance .... My question is tho, how can one also 'assign' referenced figures '(Fig.4)' in the text to do the same thing - aka change when an image is added above it? EDIT: Figured it out.. In word go to Insert and Cross-ref and assign the ref. 13/06/2017 · I use Word 2010 and would like Word to restart numbering of my figures and tables after each chapter (NOTafter each section). For example, captions of figures/tables in Chapter 1 should read Figure/Table 1.1, 1.2, 1.3, etc, and captions of figures/tables in Chapter 2 should appear as Figure/Table 2.1, 2.2, 2.3, and so on. I use the built-in Heading 1 style for chapters.